Optimization problems such as inverse dynamics and parameter identification problems are solved in ProtoFrame® by using the adjoint method. Although these methods are highly efficient, the implemented model reduction method allows to analyze simulation and identification tasks. Given the redundant dynamical model as governed by e.g. FreeDyn, the model reduction technique , which is based on a velocity-level POD, analyses both, the physical and the constraint degrees of freedom (DOF) for their relevance in the present dynamics. If any physical or constraint DOF is not actuated during simulation or acts equal to other DOFs, such redundant information can be excluded for upcoming considerations. In the case of the V8 crankdrive example, which is part of the ProtoFrame package, the number of DOFs is highly decreased. The model reduction procedure identifies 5 out of 51 translational DOFs as independent. In the same manner, 6 out of 68 rotational DOFs are identified as independent and further, the number of constraint equations is reduced to ten. 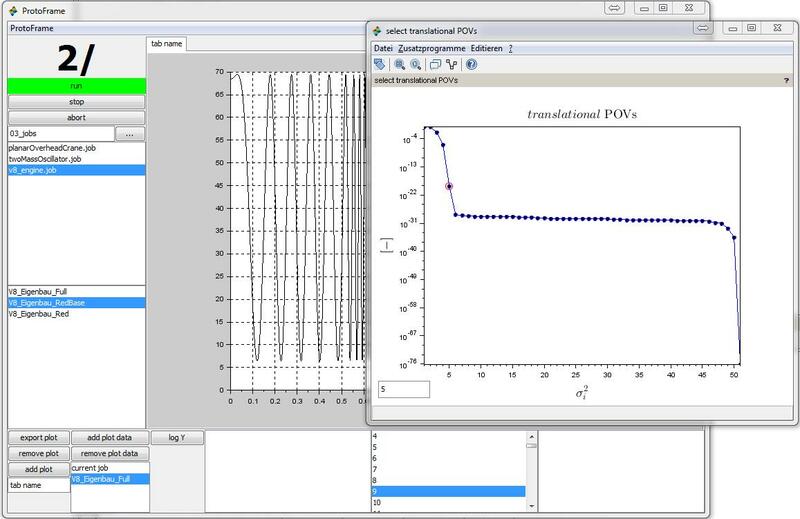 Thereby, the online simulation time is reduced by about 36% while allowing a relative position level error of less than 2%.